(postscript to The Best of all possible worlds). The last few pages of conclusion in Hoggart’s book are worthy of further comment, now that I’ve read them. His book was originally going to be titled The Abuses of Literacy – and I think that would have been more appropriate. In some ways, Hoggart is tilting at the old idea that “a little learning is a dangerous thing”, that by empowering the working classes with literacy and elementary education, they were being exposed to exploitation by forces to which they were previously immune, in the form of junk commercialism. In doing so, they lost much of the naive honesty of their basic but authentic way of life, and it occurred to me that this is epitomised by the traditional music that I find so appealing. What is important about it is precisely its honesty: for all its rough edges and lack of tutored skill, the fact shines through that it was produced by real people in real communities, unlike the passively-consumed commercialised pop music that replaced it, whose sole purpose was to make money. It is ironic that it is largely the educated classes to whom traditional music appeals today. This is a very difficult point: should one provide people with education (and hence aspiration) that may ultimately damage them? The answer probably has to be yes, but it goes to show how little control it is possible to have over the ‘outcomes’ of the process. A more difficult question still is whether a materially advanced and (excessively?) comfortable society is preferable to a basic but more ‘honest’ one. I’m really not sure – especially as from an educational point of view, that complacency seems to be breeding a growing indifference to the many other less passive but more cerebral dimensions of life. Is a modern society that is materially rich but culturally bankrupt, whose only common standards are the lowest, really worth teaching for? Hoggart claimed that commercialism needed to appeal to the lowest common denominator in order to sell enough copy to turn a profit. He argued the semi-educated working classes were particularly exposed to this – but one might consider that the subsequent development of a rampantly materialistic market-society has extended the same vulnerabilities to other groups too. These days it is not only the poorly-educated who fill their minds with pulp fiction, reality T.V. and other junk culture. Affluenza has tended to be the result – in some way a worse life, not a better. One of Hoggart’s final points is that the true conflict in society is not between the educated and uneducated, but between the authentic and the inauthentic. In the time since he wrote, the superficial values of the commercial world have come to dominate our society to an extent not seen in our continental neighbours – and they have come perilously close to consuming our education sector in the process. The real tragedy is perhaps that education, which might have stood up for more substantial values has, over the past few decades sold itself, first to the misguided progressive social engineers, and more recently to the demands and processes of the market economy. Our new(ish) Education Secretary seems to have ruffled many feathers with her recent comment that we should be able to judge the respective worth of academic subjects by the eventual earning power of the recipients. I was appalled at this, and a bit of me suspects that even her not-much-missed predecessor would never have come out with something quite this crass. If I were to let it bother me, I could be very indignant indeed that the person in charge of our education system sought to devalue my own achievement purely because it has led to only relatively moderate earnings. Perhaps she would rather I left teaching and became a banker? Daisy Christodoulou posted an eloquent and elegant objection to this hyper-materialisation of education’s aims here, pointing out that the perception of education as an economic tool is relatively recent, and that the cultural, societal and even political applications of education predate it by a long way. She perceptively observed that education was seen to have a desirable purpose long before people became as wealth-obsessed as they arguably are today. Whatever industrialists and politicians might think, the actual effect of education can only ever be personal. Whatever learning does to one’s brain is ultimately of no direct relevance to anyone other than the individual concerned; that is why education remains fundamentally a cultural attribute. While wider society might reasonably be interested in who can do what, and the individual, too, might seek wider validation of their efforts, that effect remains entirely cerebral. Trying to misdirect it for economic – or any other – specific purpose can only result in the devaluation of its wider benefits. “…the well-stocked mind [is] a virtue in its own right and… to be curious creative and spiritually aware [are] good things”. This is a sentiment that I endorse wholeheartedly, and it is a major reason why I get out of bed on dark winter mornings. It ought to be possible for politicians (and others) to accept this on its own terms as a key component of a good society. This is about giving whatever meaning to individual lives that their owners later seek, and if some apparently ‘educated’ people really are insufficiently reflective to appreciate this, one is forced to doubt whether they really are very educated after all. Some individuals may indeed choose to deploy their intellect for the single-minded pursuit of material wealth, but that choice is still the product of individual reasoning. So long as it does not involve the exploitation of others, it is hard to object, though one might hope that wider reflection would lead to a more considered understanding of the limitations of such a life – and also galvanise the potentially-exploited to resist their guile. Like all teachers, I want my pupils to “succeed” – and for all the semantic arguments over precisely what this means, I think it is still a noble sentiment. For children’s consumption, we probably don’t need to engage too much in the philosophy, but what concerns me is that success is now only defined in terms of hard cash – as Ms. Morgan effectively suggested last week. I most definitely went into education to help people realise their potential, and there is always going to be a tension between that and the (in)equality of the outcomes. But I did not go into it believing that the only, or even most important, indicator of that is their earning capacity. While competition can be healthy, it does not by any means suit everyone and can easily become an obsession in itself. The notion that education is about gratuitously beating the opposition (and amorally either ‘playing the game’ or ‘gaming the play’ in order to do so) is alien to me – and yet it seems to be the principal premise behind the values I see being expressed in school every day. My own objective could not be more different. The aggregate benefit of education to society can only be achieved by the success of each individual’s educational experience on its own terms. I see my role as firstly the development of children’s intellect and secondly, the transmission of one particular field of knowledge. What they do with it in later life is their concern, though I hope it will contribute to both an individually fulfilled life and one that contributes to the wider wellbeing of society. Narrowing this remit to economic supremacism devalues many of the other attributes needed for both of the above. Securing a comfortable material quality of life is not a reprehensible aim – but it is diminished if not set in a more widely sustainable social and psychological context. I have deep reservations about the worthy teaching of ‘life skills’ as it reduces the development of personal qualities to just another external fix. The best way to promote enlightened thinking and behaviour is to equip people with the perspective to think it through for themselves – and this comes through the long-term development of thoughtfulness. This is not about creating champions (financial or otherwise) but about the development of the general fabric of society and its everyday quality of life. It is not about grit, so much as a sense of realism and proportionate expectation, of balancing one’s own needs with those of others. It is about giving people the ability and dignity to make their own considered life-choices rather than foisting political or economic ones upon them. There is a far greater total benefit to be had from that, than the production of the occasional winner – and thousands of also-rans. A successfully educated person is one who can bring that perspective to bear on any aspect of life that they need or choose. Many thoughtful people realise that a widely well-lived life may even require the deliberate rejection of highly materialistic values. Arguably, it is also those academic disciplines that have a less direct line to high earnings that do most to promote such socially-responsible views. Yet by Morgan’s criteria, these people and their education count for little. Success in this context refers as much to the quality of one’s relationships, one’s participation in wider society, the fulfilling use of one’s time, and a belief in one’s ability actively to influence these things, as it does to the size of one’s tax bill. Shall I leave now? “In Switzerland they had brotherly love – they had 500 years of democracy and peace, and what did that produce? The cuckoo clock.” Orson Welles (Harry Lime) in ‘The Third Man’. There is much else that I could mention, but I have tried to highlight aspects of the country that might be of significance from an educational point of view, in the widest sense of ‘what it’s all for’. These are the things that seem to contribute to the higher quality of life that I admire about the country; it’s noticeable that they are not all concerned with the country’s renowned material wealth. I have tried to remain reasonably objective, and leave the reader to form what conclusions they will. 1. Principle Number One: Switzerland as a single entity doesn’t exist: as a federation, much power is devolved to canton (province) level, this even extending to income-tax rates. This does however create some strong internal tensions, for example between cantons with more and less favourable tax regimes. There is no national newspaper or T.V station – nor even a single national educational system, that also being locally determined. This makes it difficult to generalise about the country – the more so the better you know it. 2. Switzerland remains a locally-minded society. Despite the global success of its companies and the high-profile branding of its national identity, many Swiss people seem firmly attached to their region of birth. This is reinforced by the language differences – not only between French, German and Italian, but between the many dialects. People are more likely to attend local universities and live in the same canton all their lives than is the equivalent experience in Britain. Tax is even paid directly at the canton and commune (parish) scale, which in turn entitles residents to a share in local services and produce, and more generally, means that residents retain a much greater control of their own communal affairs than is the case in the U.K., where local government has been progressively eroded. A disadvantage of this can be a degree of sometimes quite indignant parochialism, as seen in the recent immigration debate. 3. This localism seems to have preserved a much greater sense of social cohesion than in our increasingly atomised society in the U.K., despite the same global and technological forces being at work. Walking round even a relatively large city like Basel, it is noticeable how many people my friend is able to point out with whom he has some social, cultural or professional connection. There seems a much stronger sense of civic pride and social obligation; social relationships seem to be taken more seriously and are less transient than in the U.K. These bonds seem deep, and are more likely to involve arranged social events such as shared trips, meals and other functions. It can all appear somewhat formal, but that doesn’t seem to diminish the sincerity. To British eyes, the Swiss are resolutely understated, and unlikely to make demonstrative shows of friendship, but once made, one can generally be certain of the sincerity. There are clearly very great levels of wealth in Switzerland, most notably around Zurich – but for a strongly-capitalist nation, the everyday Swiss are surprisingly egalitarian. The divide between the rich and rest seems narrower than in the U.K., though I suppose it may just be more discrete. Certainly, there seems to be less evidence of public figures buying themselves exclusivity, while on the other hand, visiting the home of some recent Serbian immigrants, I noted the living conditions (if representative) while somewhat dated, were far from the deprivation still found in parts of British cities – and were certainly still well-planned and built. 4. Public life in general seems to be in much better health than in the U.K. The referendum structure leads to more participation in decision-making, with documents being published several times years detailing the issues for forthcoming votes. There seems to be a noticeably higher level of cultural activity – including high culture – in which people participate. One sees posters everywhere; I suspect it is partly the devolved nature of the country that ensures that high-quality art and music are available in more than just a few large cities. Local activities widely seem to be of a high standard. 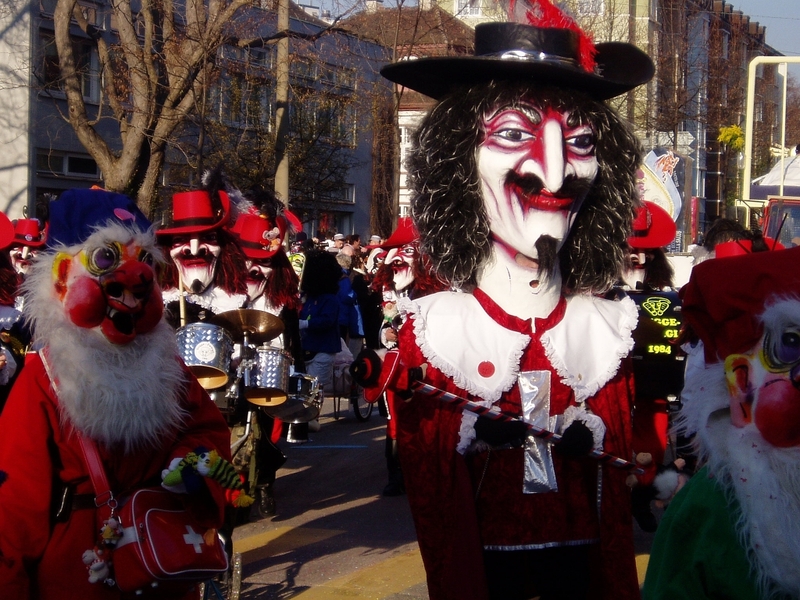 Despite its modernity, Switzerland also retains a respect for the country’s traditions, such as the various seasonal fairs and the Fasnacht carnivals of February, which retain an almost medieval system of lodges, the cultural and social activities of which enlist trans-generational loyalty on an ongoing basis. Traditional academic disciplines and achievement seem to retain a respect and rigour not widely seen in the U.K. – but there is also an unselfconscious acceptance that trade is important too: vocational training is not seen as second-class. 5. The infrastructure works. The rail system is legendary, of course – but the road network is equally comprehensive, high quality, and designed to maximise efficiency (greater use of flyovers etc.). Consequently, the driving can be surprisingly ‘unrestrained’… Just as important is the planning that goes into making the system work for the convenience of the whole population, not just an elite that is able to pay for exclusive access. It seems clear from the way that new projects are planned and promoted – often at visionary scale – that they are seen as the entitlement of the whole population. There is no stigma attached to public transport – one sees people of all sorts using the trams and buses (all of which are scrupulously clean and punctual, if not cheap) and car use is significantly lower, at least in larger centres, than it is in the U.K.
Also noticeable is the large amount of manufacturing that still goes on – not often heavy industry, mostly light manufacturing of high-quality, high-precision goods. There are many modern, clean and efficient business units in most urban areas, and not infrequently in rural ones too. There is more provision for plurality – for example by the creation of a wide network of off-road cycle paths, and the universal signposting of national footpaths: it is not assumed that everybody wants to function in the same way as an increasingly herd-like British mentality seems to do. The corollary of this civic vision is a less paternalistic tone than sometimes occurs in Britain: it seems very clear that the rights of the autonomous citizen also extend to a high degree of responsibility and self reliance. The sense of equalising opportunity extends nation-wide: unlike in the U.K., greater investment seems to go into remote areas (of which there are many) in recognition of their greater handicaps. The quality of works in even the remotest mountain communities is frequently no less than excellent by U.K. standards. (In Britain, the contrast in provision in particular between London and the further regions is reaching the levels of a scandal – recent figures suggest annual per capita public investment in London of over £2700 – and of just £5 in the North-East). This does not mean that everything is up-to-date; when the Swiss build from new they build ultra-modern – but because quality tends to be so high, things last, and it is not unusual to find artefacts and facilities many decades old: things tend not to be replaced until they wear out, not just for the sake of conspicuous fashionability. Switzerland retains much medieval architecture (there was almost no destruction in WWII) and the vast majority of it seems to be extremely well maintained. 6. The environment in the widest sense, is very important. This extends from the high quality of residential properties and neighbourhoods, through the generally well-maintained urban fabric to an awareness of green issues. While there has been a degree of coercion to achieve it (for example, fines for people who fail to recycle waste) Switzerland now leads Europe in its recycling rate. The general awareness of green issues is everywhere, in the construction of new buildings and transport through to the widespread provision of recycling points (including in schools), to the assiduity with which people turn off lights when they leave rooms. It is perhaps not surprising given the enviable nature of their scenery, that the Swiss are a far more physically active nation than the British. At weekends and holidays, the countryside teems with walkers, cyclists and others; national transport is set up for example to allow the easy carriage of bicycles and skis around the country. The school calendars are arranged to allow families skiing holidays – and indeed participation in the annual carnivals in places where they happen. 7. Ruskin said of the Swiss, “They were…neither heroic nor base, but were true-hearted men…proud yet not allowing their pride to prick them into unwary or unworthy quarrel. You will find among them…only an undeceivable common sense…they use no phrase of friendship but they do not fail you at your need.” I think some of that still rings true. There is very little showing-off in Switzerland – while quality is rated, showiness tends not to be. Wealth is not flaunted – perhaps because much of it is not new money; with no aristocracy to claw back from, the nation’s inheritance laws have ensured that a relatively high degree of wealth has been passed down the generations – which of course is also an incentive to be economically productive and efficient oneself. One group of our guests was bemused by school uniforms; when asked what they were for, a quick answer seemed to be to stop the pupils having a fashion competition. The response was, “Why would they want to do that?” To British eyes, Switzerland tends to be a model of restraint; to the Swiss, I think it’s just natural. There is consequently less hype than in the U.K. Quality is a given, but people just seem to get on with things rather than having to trumpet them to all and sundry. There is little talk of ‘world-class’ this or that, just a quiet intention to makes things work, and work well. While luxury clearly exists, greater Swiss life is actually quite functional, in a modernist sense (after all, the father of modernism, Le Corbusier was Swiss). Swiss trains, for example, don’t provide luxury – but everywhere you look things are of understated high quality. The presumption is that things will work – and that extends to the entitlements and expectations on individuals. There seems to be a much greater degree of individual trust in the workplace, an assumption that people will do the right thing unless proven otherwise – and if that should happen, it will be dealt with discretely, without any shows of temper. But there also seems to be a greater degree sense of equality: far more is done through negotiation than imposition; consensus seems important. One downside of this can sometimes be impatience when things don’t come up to scratch; I suppose it isn’t surprising that perpetual exposure to high standards accustoms people to them. 8. The social contract is different. Rules exist that to British eyes seem quite draconian, such as evening or weekend restrictions on washing cars or laundry; the law requiring all cars to have winter tyres is perhaps just common sense. Registration plates attach to the owner, not the vehicle – which makes tracing people who drive badly a distinct possibility…The clear rule is that the individual should forgo some liberty for the sake of communal harmony; it seems to be accepted. A major contrast with the U.K. is the requirement for men to do annual military service. I have attempted to avoid the more esoteric foibles of Swiss culture; my main aim is to look at ways in which everyday life – from practicalities to attitudes – inform a society that is more balanced than the British, that retains a healthier balance between economic priorities and social cohesion, that still has a sense of vision, as seen in its environmental stance and its cultural and intellectual richness. It seems more truly classless than Britain – though it needs to be admitted that this coherence comes at the price of sometimes-strident disapproval of ‘outsiders’; immigration is an issue that the Swiss are still struggling with – but with non-Swiss making up 20% of the population, maybe that is a little understandable? The Switzerland I admire is not the Heidi-and-chocolate-box country of stereotypes, but a very modern, functioning nation. I think one thing I have realised in my sustained relationship with it (and my travels elsewhere), is just how closely the lives, opportunities and outlooks of individual people are influenced by – and govern – the social structures of the whole; I believe the same applies, perhaps rather less benignly, in the case of my own country. I hope I have avoided hagiography, but have now set the scene to look more closely at the Swiss education system in a future post. After a week when an independent school headmaster stated that he felt making (bad) teachers’ private lives hell was fair game, I think it does us well to regain a better sense of proportion. Such an impasse really does mark the point when the lunatics have taken over the asylum, and it’s worth remembering that not only does life go on ‘outside’ but we are actually meant to be part of it, rather than in a bubble all of our own. It’s for this reason that I always try to contextualise my thinking about teaching within wider issues – after all, education is for life, not the other way round. Apart from anything else, I’m not sure how we can function as educators without having some perspective on how both we and our pupils fit into day-to-day life, and indeed the bigger picture. I have found that some of my most helpful perspectives on teaching have come not from the endless shelves of books dedicated to classroom practice, but from those covering other matters entirely – which can nonetheless throw useful shafts of light on life as a teacher. My current reading, for example, is I Spend Therefore I Am – the True Cost of Economics by Philip Roscoe, which is provoking insight into just how far the ‘economization’ of life has arguably gone, and with what effects; more on this another time. This is also the reason why I have always engaged with internationalism: seeing how another society does things is an excellent way of looking into one’s own bubble from the outside for a change. To my mind, this is indispensable for any teacher who wishes to retain a greater sense of what it’s all for in the first place. The benefits of doing so can also be found in the recent writings of Tim Walker, an American teacher living in Finland. I once asked the philosopher Alain de Botton (himself half-Swiss) whether he thought it possible ever to know another country as well as the natives do; the predictably unpredictable reply was yes, in fact he thought outsiders could in some ways even know a country better, as they tend to notice things that the locals take for granted. So if we are still motivated by the ideal of making for our country and people a ‘better future’, then maybe there are lessons we can cautiously learn from elsewhere. In my case, I am fortunate to know Switzerland well, having travelled there many times since childhood and having had friends there (both ex-pat and native) since the late ‘80s. I visit at least yearly, have been to most parts of the country, and through repeated visits have come to know a couple of localities in both the French and German areas very well. The ‘real’ Switzerland is, of course, not the country of the ‘chocolate box’ stereotype, but a modern, working country that just happens, in my view, to have got many day-to-day things right. But before one can attempt to assess a single undertaking such as the education system, one really needs to set it in context. I hope readers will bear with me and appreciate the brief respite from my grumbles about the less-than-perfect aspects of the British education system! Even with extensive familiarity, though, it is still never easy to know whether one’s impressions are either accurate or representative – and how can one hope to sum up even a small nation in the space of a blog post? Nonetheless, I will attempt to share some of my experiences and welcome any corrections from anyone who knows the country better than I. Should all this provoke further interest, I suggest the books of Diccon Bewes, whose ex-pat experiences offer an easily-read, if slightly glib introduction to the nation. Switzerland is by no means perfect: it struggles with aspects of its recent past, and also with some aspects of the present day, as the globalised world increasingly impinges on its own distinctive way of life. That has been shown in recent days by the referendum vote to limit immigration, which is going to renegotiate Switzerland’s relationship with the E.U. Well, I suppose democracy carries with it the right to be wrong – but for Britons, perhaps a more significant lesson is the fact that Swiss democracy means that any citizens’ petition garnering more than 100,000 signatures automatically triggers a national referendum, the result of which is legally binding – even on the government. What would be the consequences of that happening in the U.K.? Despite the obvious differences, Switzerland shares some experiences with Britain: both nations in some ways are ‘outsiders’ in the wider Europe, while still remaining inextricably bound to it – the British because of those 26 miles of water, and the Swiss because of their historic mountain barriers. There is also a bond between the two nations that stretches back to the 19th Century when British tourism started to develop what was then still a poor, marginal land. It is noticeable even today that there seems to be a natural empathy, visible in the way our groups of students almost always bond strongly, the British parents more-than-normally receptive to hosting Swiss students, in a way that does not always happen with other nationalities. It’s difficult to draw conclusions from either nation’s past; despite determined independence, Switzerland’s historic relationship with Germany, for example, could not but be influenced by the two countries’ proximity. In Britain’s case, the effects of early industrialisation, Empire, a strong social hierarchy and two world wars remain ambivalently with us. Likewise, it is pointless considering Swiss approaches to life without remembering that in per capita terms it is one of the richest nations on the planet; without delving too deeply into how that came to be, it is incontrovertible that levels of public investment and provision in Switzerland are a reflection of that wealth. We also need to bear in mind that the practicalities of doing things in a nation little over 200 miles long, with a population of eight million, are different from those in a nation of 63 million extending over several times that distance; on the other hand, Swiss and British population densities are very similar once one excludes the uninhabitable areas of the former (which themselves present unique challenges). So we have to be careful about conclusions drawn from such comparisons, but that accepted, I think ordinary Swiss life can still provide thought-provoking experiences for those of us in education who are concerned with making that ‘better future’. Gene-ie out of the bottle? The slow-motion debate about the role heritability in educational achievement rumbles on. In an article for the current Prospect magazine, Jill Boucher who is a professor of developmental psychology at City University has written about her own experiences with her adoptive (now adult) children. She claims that the science is clear – genetic inheritance does play some part in intellectual development, educational outcomes and perhaps social mobility as it does in every other aspect of human development. (The article does not delve deeply into the science – it’s probably not the most appropriate place to do so).The fact that those of certain socio-political persuasions find this unpalatable nonetheless cannot deny the science, and may in fact cause the issue to be driven underground rather than to be identified and addressed. Boucher and her husband, both holders of doctorates, adopted two children who it turned out, were of unremarkable academic ability. Despite every possible exposure to educationally-positive values and environments, and the role-modelling and support of two highly-educated parents, neither child achieved more than a small number of G.C.S.E.’s. However, both are socially well-adjusted and hold down secure jobs, one as a lorry driver and the other as a chef. This is, of course ‘merely’ an individual anecdote, but one that nonetheless poses a difficult question for those who maintain that the correct environmental factors are all that is necessary for high achievement to follow. A false dichotomy has been set up by those who reject the genetic claim: that to accept it is to give up on the developmental potential of education, somehow akin to eugenics, and at least tantamount to writing off large numbers of people from an early age. This is not so: to accept that people have their limits is certainly not to give up on developing them as far as they may be able. I am quite comfortable with my own approach as evidence of this – for all my love of high academic levels, I would rather work with less able but positively-inclined pupils than brilliant but lazy ones. Neither is the genetic case an argument for only concentrating educational resources on the brightest – as Professor Robert Plomin (whose work sparked the debate when picked up by Michael Gove’s special adviser) has said, one use of such information might be to target special needs provision earlier and more accurately. Boucher says that in no way did their children’s lack of educational achievement compromise their experience of a caring upbringing, nor has it made them deficient members of society. The assumption that those who do not achieve high academic standards will somehow be deficient and most-likely ‘failures’ is arrogant and demeaning in its own right, and verges on a contingent view of human affection. For all that we largely lack a formally selective educational system, the tyranny of high achievement is, if anything, greater than ever. Only it is now predicated not on intelligence for its own sake, but for the potential it supposedly creates for high earnings and a climb up the ladders of power; the zero-sum culture now thoroughly ingrained in the outlook of many high-achieving schools certainly echoes the values of a winner-takes-all view of the world. This is a visibly-powerful driver in the social-educational values of south-east England, where the assumption seems to be that to have made it, one (still) needs to have secured a plum job in the City. The whole notion of educational ‘success’ has been narrowed to the extent that it is now defined by a small spectrum of income and occupational parameters that the majority of people will never attain – and in many case will probably never want or need to. By identifying this issue, Boucher has highlighted one of my own enduring concerns about the high-stakes model: it imposes an implicit value-system onto what education is for – the acquisition of wealth and power, which is increasingly what educational ‘success’ seems to mean. As Boucher points out, what is wrong with educating people for a more modest life? It is arguably better to produce a society of well-balanced, responsible individuals who perform unspectacular but nonetheless very necessary roles, rather than produce a few high flyers and label everyone else as also-rans. This is neither defeatist nor anti-excellence, simply a more realistic appraisal of what may be possible and indeed desirable. In my view, the acceptance of the genetic factor is best taken at a general level. To attempt to predetermine any one individual’s capabilities as a result of it would indeed be insidious, but used as a general rule of thumb, it can simply allow us to make a more realistic appraisal of what might be possible, accepting that success and failure need not only be defined in terms of the highest grades. Neither need it taint the genuine pleasure we feel in those individuals who go on to achieve more than might have been expected of them. The much-vaunted case for education as generator of social-mobility (only ever upwards, note) may be both overstated and unnecessary. This may be the most-asked question, on discovering that someone is a teacher. On the first day of my post-graduate teacher-training course back in the mid-’80’s we were told that there is only one answer: Children. Passing swiftly over the fact that children are not ‘What’, this was my first experience of the doctrinaire world of professional education. Over the ensuing months, it was rammed home that one’s teaching subjects are merely vehicles for the delivery of the bigger social plan. Other than that, they are just the obscure eccentricities of the intellectual elite – along with high culture. It was all very Eastern-bloc. In a way this was remarkably prescient, because that is certainly the line that successive governments have since pursued as they have increasingly meddled in a hitherto largely-autonomous sector – right up to the present, controversial Mr. Gove, who seems to have other ideas. I suspect part of the educational establishment’s paroxysm at this man is the fact that he dares to question this article of faith. There is an interesting article in this month’s Prospect magazine, centring on the work of John Goldthorpe, Emeritus Fellow of Sociology at Nuffield College Oxford. His interest is in social mobility, which he has researched with particular reference to Twentieth Century Britain. The dream of increased social mobility is a fundamental driver of the social-engineering view of education; as usual, the reality tends to be different. Goldthorpe distinguishes between absolute mobility (in which everyone moves up the scale) and relative mobility, when people move relative to each other. It is the latter that tends to preoccupy educational policy-makers. But there is an uncomfortable problem: relative mobility implies that for some to move up, others must move down. This rarely happens, and would seem to conflict with notions of social justice – unless one is taking a hard-left revolutionary view of the role of education… The dream turns out not to be realisable. Goldthorpe goes on to explode the misperception that mid-century mobility did exist and has now stalled. He found that the odds on a working-class person moving into the middle class have barely changed since the start of the twentieth century. The period in the 1950s and 60s when this did seem to be happening did not result in a fall in the privilege of higher-status groups, even if some of their wealth was appropriated. The reason people were able to move into the middle class is explained simply by the major shift in the economic structure of the country, away from manufacturing towards services: blue-collar jobs declined and the demand for white-collar jobs expanded, which was met by the more educated members of the lower classes (who – my parents amongst them – had mainly attended the grammar schools so hated by the social engineers). As this process slowed, so did the apparent social mobility. Accept this view and at a stroke you remove one of the key determinants of the current instrumentalised view of education. If then, education is negligible as a force for social mobility, we are forced to ask afresh what precisely the whole thing is for. I will come to that another day.